Ask about our ground floor villas which are the most requested in Rocky Point. This luxury beachfront community redefines elegance. Bella Sirena Rentals offers a resort-style atmosphere with the highest level of service. Its exotic landscaping and zero-edge pools overlooking the ocean are the finishing touches to this beachfront resort community. From the abundant landscaping to the extravagant water features and hand laid stone streets, you will find the romance of Old Mexico blended with uncompromised quality and design. Bella Sirena Mexico Rocky Point is a great vacation destination in Puerto Peñasco, Mexico. Every Bella Sirena Condominium has its own panoramic view of both the ocean and the unique landscapes that surround Puerto Peñasco. Our desert sands meet the crystal-blue ocean to create seemingly endless miles of sandy beach. With crystal clear negative-edge pools, elegant courtyards and tropical trees, we put together the finishing touches for this great location's exotic appeal. Bella Sirena designs combine Sonoran beauty with new dimensions of comfort, and luxury. The world of Bella Sirena simply provides the quality, service, and value expected by our guests. Discover Bella Sirena. Experience for yourself. Bella Sirena rises from the golden sands on the north shore of the Sea of Cortez. She is one of the newest and most luxurious full-service residential resorts in Puerto Peñasco, Mexico, also known as Rocky Point. Old-world architecture inspired by Mexican and Tuscan Villas creates a dramatic backdrop for breathtaking views from any residence. Beyond the majestic scroll-iron front gate unfolds hand laid stone pathways, lush Mediterranean gardens and the romance of old-world Mexico that is Bella Sirena. Spacious living is part of the grand design in this Sonoran oasis. The 220 elegant homes are thoughtfully spaced over 14+ acres. Panoramic views are the star attraction inside each of the 200 residences and penthouses in five condominium towers on the Puerto Peñasco property. Just a few steps from the sea, 20 beachfront and ocean view villas adorned with handcrafted cupolas, offer a more private escape. three-bedroom, Tuscan-inspired penthouses are accented with nine-foot ceilings, brick and cantera domes, elegant dining areas and exquisite master bathrooms. Atop the Coral Tower, four grand penthouses offer unparalleled luxury with private elevator access, custom water features, a billiard room and wine room with space for 650 selections. Granite countertops, modern kitchens and open design plans are standard at Bella Sirena, raising the bar in Puerto Peñasco luxury. This full-service residential community offers its members a long list of indulgent amenities: infinity pools, signature spa, gourmet food market, boutique shops, fitness center, poolside bar and day grill, tennis court, Bocce ball and beach fire pit. Once a quaint fishing village described by Jacque Cousteau as the "Galapagos of North America," Puerto Peñasco, is now one of the fastest-growing resort towns in Mexico. Only a 50-minute drive from the Arizona-Mexico border, Rocky Point has long been a favorite rustic vacation spot for Americans. The town even gained some notoriety as a hideout for Al Capone. An ancient lava flow created the natural outcropping that gave the town its name. The old downtown now rests on the "rocky point". Miles of white sandy beaches, warm waters and 340 average days of sunshine make Puerto Peñasco a Mecca for fishing, water sports and those who can't resist the drama of its "desert-by-the-sea" beauty. 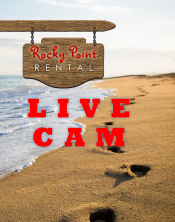 Bella Sirena Luxury Condo Rentals is brought to you by Rocky Point Travel - Rocky Point's Travel Agency.